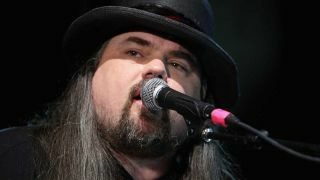 Singer and songwriter Shawn Smith has died at the age of 53. The cause of death of the former Brad, Satchel and Pigeonhed vocalist has not yet been announced. The news was confirmed by a number of fellow musicians, including Posies founder and occasional R.E.M. member Ken Stringfellow, who wrote, "So sad to wake up to the news about the passing of Shawn Smith. Shawn and I shared a mutual close friend, and thus Shawn would frequently house sit for me when I was on tour, writing (and sometimes recording) on my piano. "The gentlest of gentle souls, with a voice that came from the deepest regions of the spirit... I hope he finds peace and rest on his soul's onward journey." Alice In Chains bassist Mike Inez wrote, "God speed to our friend Shawn Smith. One of the great Seattle voices. Rest In Peace Brotherman." Smith reportedly passed away on April 5, a date that also marks the deaths of Seattle legends Kurt Cobain and Layne Staley. In 1987 he moved to Seattle, where he joined Malfunkshun alongside Regan Hagar and brothers Kevin and Andrew Wood. The latter went on to form Mother Love Bone with future Pearl Jam members Stone Gossard and Jeff Ament. Smith began work on his first album in 1992, after Sub Pop founder Jonathan Poneman introduced him to local producer Steve Fisk. The album was released under the name Pigeonhed, and also featured Soundgarden guitarist Kim Thayil. The same year he formed Brad with Gossard (by now with Pearl Jam), drummer Regan Hagar (also a member of Mother Love Bone), and bassist Jeremy Toback. The resulting album, Shame, was released in 1993. Smith went on to front another four Brad albums, Interiors, Welcome to Discovery Park, Best Friends? and United We Stand, and two with the rockier Satchel, EDC and Family. He also performed on The Afghan Whigs' 1996 album Black Love, and on Whigs' founder Greg Dulli's album Twilight As Played By The Twilight Singers. Dulli once described Shawn Smith ‘Seattle’s best-kept secret’. In the years since Smith made a series of well-received solo albums, and formed other bands including All Hail The Crown and From The North, in which he was joined by Regan Hagar and Kevin Wood. In 2004 his song Wrapped In A Memory was used to poignant effect over the end credits of the Long Term Parking episode of The Sopranos.